On April 4, everyone’s favorite “Grumpy Cat” turned 2-years-old, giving the “terrible twos” a whole new meaning. 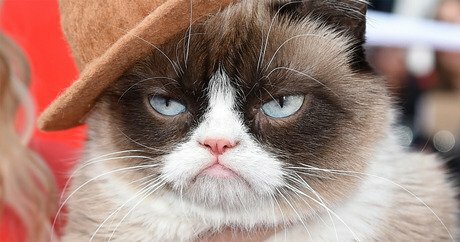 Grumpy Cat, whose real name is Tardar Sauce, or “Tard,” was born with feline dwarfism, which makes her much smaller than a typical Siamese–Snowshoe mix — and gives Tardar her trademark scowl. Thanks to a plethora of wildly popular Internet memes, Grumpy Cat has become an international feline celebrity. She even has her own agent and serves as a spokes-kitty for Friskies. Grumpy Cat celebrated the day she came into the world by frowning her way through a trip to the Vogue Magazine headquarters in New York City, according to E! Online. She took to her Twitter to share her take on her Vogue visit. “I went to @VogueMagazine once. It was awful,” she tweeted, chronicling her outing to the fashion mag’s offices. A few days later, Grumpy Cat got her own front row seat at the MTV Movie Awards, where she also won Best Dressed for sporting a miniature version of music star Pharrell’sfamous hat. Then, on the evening of April 29, Grumpy Cat was the feline guest of honor at her official birthday bash, which included the grumpiest cake ever baked. Jersey City, N.J., cat lover and stray cat advocate Kayt Hester was invited to attend Tardar Sauce’s posh party. “It was very swanky, very fancy,” Hester tells NJ.com, describing Grumpy Cat’s special celebration. Grumpy Cat’s owners, brother and sister Tabatha and Bryan Bundesen, couldn’t be prouder of their little grouch. Bryan says Tardar Sauce isn’t quite the curmudgeon she appears to be. “She’s also such a happy cat,” he insists.